American manned lunar lander. Study 1961. A direct lunar lander design of 1961, capable of being launched to the moon in a single Saturn V launch through use of a 2-man Gemini re-entry vehicle instead of the 3-man Apollo capsule. Status: Study 1961. Gross mass: 18,500 kg (40,700 lb). Height: 12.47 m (40.91 ft). Span: 6.61 m (21.68 ft). Following the preliminary decision to proceed with the lunar orbit rendezvous technique for the Apollo lunar landing mission, there was one final effort to return to the simpler direct landing approach. Lunar orbit rendezvous would require a three-man Apollo capsule, in order for a crew of two to reach the lunar surface while the third crewmember tended the waiting Apollo in lunar orbit. But if the objective was to land two men on the moon, why use the three-man Apollo capsule? Why not use either the two-man Gemini capsule, or a reduced size two-man Apollo-shaped capsule to land directly on the moon? Such a spacecraft could be propelled toward the moon on a single launch of the Saturn C-5 rocket, just like the LOR version. McDonnell, builders of the Mercury and Gemini spacecraft, were given the contract to make a study of the alternate approach. The result showed it was indeed feasible, at less cost, risk, complexity, and time, then the LOR 3-man Apollo. The only problem was that the existing work done on the North American three-crew Apollo would have to be scrapped, and either a modified Gemini or a new two-crew Apollo developed in its place. Wiesner, Kennedy's science adviser, was an enthusiastic about the approach. NASA, North American, and the competitors for the lunar module contract were distinctly less interested. Webb, the NASA Administrator, finally got the idea spiked once and for all. Although Gemini lunar landers would be advocated again, as rescue vehicles, or whenever Apollo ran into development trouble, they would never get past the very preliminary paper stage. Launch vehicle was the Saturn C-5, injecting 40,800 kg to a lunar transfer orbit. Mission duration was eight days (two and one-half days flight time to moon, one day on lunar surface plus one day contingency, two and one-half days return time plus one day contingency) plus seven days post landing (one day habitable environment plus six days survivable environment ). Both cryogenic and noncryogenic propulsion systems were to be considered. The final configuration used a LOX/LH2 RL10-powered stage for the major lunar crasher stage, and N2O4/MMH storable propellants for the lunar landing and ascent stages. Atmosphere was 5 psi normal, 3.5 psi emergency, 100% oxygen. First operational flight during the first half of calendar year 1967 was assumed. Lunar Gemini I used the as-then-configured, 14 day, earth orbital Gemini command module and service equipment with only those changes considered necessary to effect compatibility with the direct flight lunar landing mission. This included the paraglider for landing at an airstrip at the United States on return. A number of methods for providing the crew with a field of view of the lunar surface during the landing maneuver appear feasible and attractive from the standpoint of minimizing changes to the basic Gemini configuration. The most promising of these were: l) use of the existing Gemini window with an erectable external mirror to provide a downward field of view with the crewman lying in the normal position and 2) use of an auxiliary transparent canopy (or use of the Gemini hatch in open position with cabin depressurized). In the latter method, the crewman was in a rotated (semi-prone) position and viewed the lunar surface directly. A combination of (1) and (2) were selected for Lunar Gemini I with the R.H. crewman provided a mirror and the L.H. crewman provided a transparent canopy through which he may observe the lunar surface while rotated in the present Gemini seat. In conjunction with this position, instruments necessary for control of the lunar landing were provided in an extendable panel located in the service module within the crewman's field of view. Necessary controls were provided adjacent to the seat sides. Lunar Gemini II utilized the then-alternate Gemini 26 m diameter single parachute recovery system in lieu of the paraglider system and associated landing gear. The weight and space savings thus effected permitted the installation of improved navigation and telecommunications capability while increasing the margin for potential weight growth. Earth landings were effected in water and, in the event of emergency recovery over land, the crew utilized the ejection seats to separate from the capsule and terminate the descent with personal parachutes. Crew lunar landing vision provisions were the same as described for Lunar Gemini I.
Lunar Gemini III was modified to accept a tower-mounted rocket launch escape system in lieu of ejection seats, thus providing an improved launch abort capability. The paraglider and landing gear were replaced by three 22 m diameter parachutes with normal earth recovery being effected over water. Means were provided for emergency earth recovery over land either through bail-out capability with personal parachutes or, by the use of shock attenuating couches to make land impacts in the command module tolerable. The use of positionable shock attenuated couches in lieu of ejection seats permitted the incorporation of a crew "sit-up" lunar landing capability facilitated by a direct view through a large window in the left-hand hatch. The major Gemini Guidance and Navigation components utilized were the inertial system and computer. Additions for Lunar Gemini I included an auto sextant and the Apollo tracking and landing radars (total system weight - 155 kg). Additions for Lunar Gemini II and III included the Apollo sextant/telescope, the Apollo tracking and landing radars, and a roll momentum wheel for use during manual navigation (total system weight - 166 kg). The power system provided was essentially the same as that used in the 14-day Gemini with some off-loading of fuel cell reactants and the addition of increased sequential control provisions. A detailed electrical load analysis indicated that the mission requirements were 660 watts average for Gemini I and 880 watts average for Lunar Gemini II and III. Sufficient fuel was provided for the full 8 day mission, two days of which were contingency. 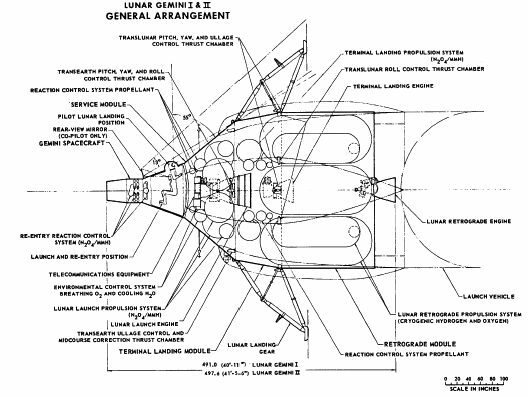 Conventional spacecraft structures were employed in all modules, following the proven materials and concepts demonstrated in the Mercury and Gemini designs. Primary structure of each module consisted of a semimonocoque shell with reinforcements around cut-outs and fittings to distribute localized loads. Titanium was used as the basic shell material in all modules except the service module where beryllium sheet was used for the structural radiator shell. Re-entry heat protection was conservatively designed for a shallow long range re-entry or a 20 g structural limit re-entry, whichever resulted in the greater protection requirements. The ablative material was MAC Thermorad Shield S-3 elastomeric composite. Nominal thermophysical properties were used in the calculations and a 1.15 factor was applied to predicted heating rates. The total ablative material design weight was 232 kg for Lunar Gemini I and II, and 221 kg for Lunar Gemini III. Family: Lunar Landers, Moon. People: McDonnell. Country: USA. Spacecraft: Apollo Direct RM, Apollo Direct SM, Apollo Direct TLM, Gemini Lunar RM. Launch Vehicles: Saturn V. Agency: NASA. Bibliography: 2180.